ClockNine’s team recently helped visually optimize Dairy Queen’s new digital menu boards. A full analysis was done of each menu to scientifically determine where the human eye falls upon first glance. The goal of the analysis is to learn where viewers eyes naturally fixate within the new design. After the analysis is complete, Dairy Queen’s design team then uses the reports to makes adjustments to their menus. This helps to ensure the right products are being noticed within their design. “ClockNine’s unique approach to digital marketing has helped us optimize our menus and increase sales of our most profitable items” stated Dairy Queen’s Director of Digital Merchandizing Janna Rider. 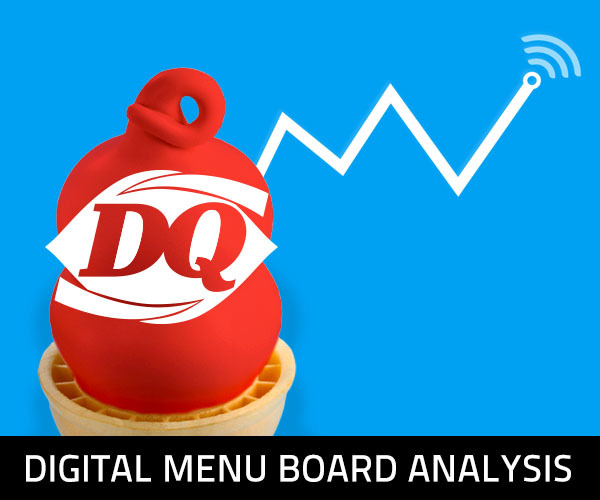 Digital menu board analysis has become a regular part of Dairy Queen’s menu design process. This analysis marks the second time the two companies have collaborated to achieve optimization. In addition to visual analysis, ClockNine also offers its expertise on ways to inject a stronger sense of focus to key areas of the menu. “Digital menus provide a unique opportunity for us to use motion guide consumer’s eyes” says Travis Kragh, Chief Creative Officer of ClockNine. “We always preach to use motion with purpose. It is important to synchronize your motion across all menus so that each area has its chance to be in the spotlight.” adds Kragh. To learn more about ClockNine digital menu board analysis email Creative@ClockNine.com.